Students in Second grade reading classes created Bat Books after reading and researching bats. They used the app Book Creator. This app allowed them to add text, pictures, and audio to their books. They really did a very nice job! There are two versions of each book: epub and pdf. The epub can be downloaded and read in iBooks (on an iPad or iPhone/iPod Touch) or any other ebook reader. You will even be able to hear your child read! The pdf can be downloaded on a computer and printed. Cross posted on the Clearbrook Digital Archive. There are two versions of each book: epub and pdf. The epub can be downloaded and read in iBooks (on an iPad or iPhone/iPod Touch) or any other ebook reader. The pdf can be downloaded on a computer and printed. Check them out below! Cross posted on the Oak Grove Digital Library. Create a Pic Collage that helps show what diversity in Virginia looks like. Include pictures and words. You must have 3 examples of ways you see diversity in your life. You must use pictures and words in your collage. Mrs. Chamberland’s class participated in the great O.R.E.O. Project this year! These second graders used their estimation, counting, and graphing skills during this project. They submitted their results online, and compared the number of oreos they stacked with people all over the world! Take a look at an example graph they made in Excel! It’s a new school year, and 2nd graders at Clearbrook have been discussing the rules for 2nd grade, their school, and their community. They used Pic Collage to make rule posters! This was a great project for introducing how to use Pic Collage, for practicing working in groups, and for learning to transfer work using the dropbox app. I’m looking forward to see what other things they create with this app in the coming months! For the past few days, I’ve had the chance to work with a reading group in Mrs. Allen’s Class. This group of students had read the book, Punished by David Lubar. I had never read this book, but the kids LOVED it and were so excited to tell me about it. The main character of the story is “punished” when talking back to the reference guy in the library and has to find different types of figurative language to lift the magical punishment. The book covers types of figurative language (oxymorons, palindromes, anagrams, and puns). Mrs. Allen wanted her students to practice creating (or finding) these types of words. After brainstorming with the group of students, we decided that they would make a virtual poster (using iPads) containing an example of each word. Students used the iPads to research and take (or find) pictures of the different word types. As they went along, they kept a list of the examples they found so they would be ready to create their poster. 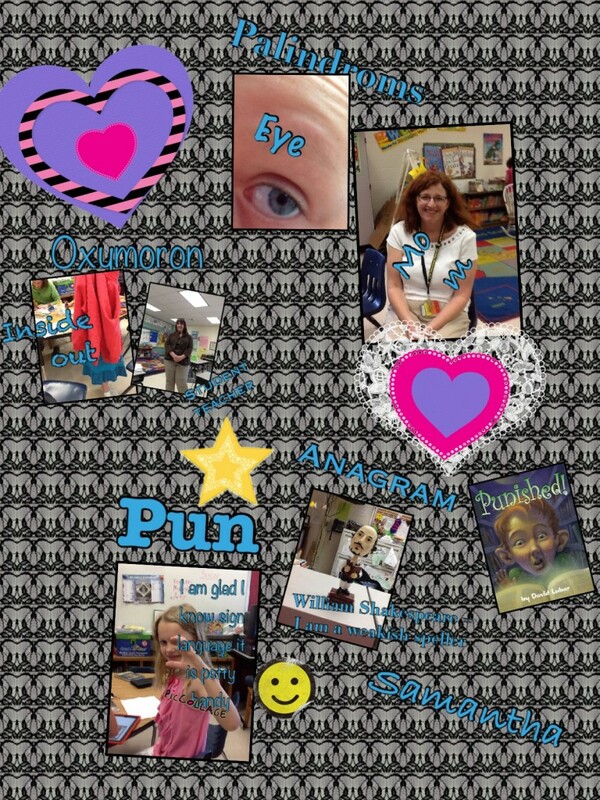 On day two, students used one of my favorite apps, PicCollage, to create their figurative language posters. They were given this sheet to help them. Below are the posters they created. They did such a great job. I had a blast watching their excitement over the project. Way to go Mrs. Allen’s Class! Second Graders at Glenvar Elementary just completed their annual Animal Research Project. They researched animals using a google custom search and created powerpoints about them! Check out their work below!